We are the original JORDAN TRUSS and are not associated with Jeff Jordan. "We Stand Under Our Work"
Jordan Truss is focused on providing high-quality service and customer satisfaction. We will do everything we can to meet your expectations. We pride ourselves in our welding and fabrication expertise and will design and manufacture pole barn truss systems to your specifications. We're sure you'll be happy working with us. Please feel free to stop by. 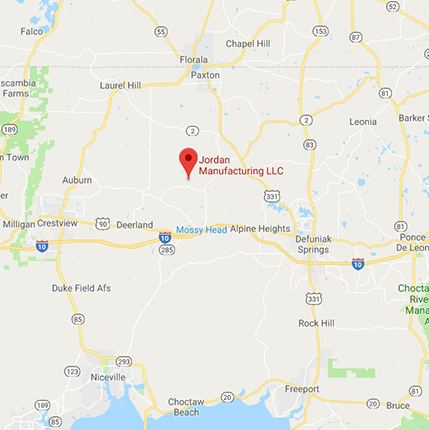 We are located in Northwest Florida, 10 miles north of I-10 at exit 70. While we proudly serve our local area, we also offer engineering services in 42 states including Puerto Rico and the Virgin Islands. Look around our website and if you have any comments or questions, please feel free to contact us. And please check on our website from time to time ...there's much more to come!